PACKAGE THIS TITLE WITH OUR 2016 MLA SUPPLEMENT, Documenting Sources in MLA Style (package ISBN-13: 9781319088637). Get the most recent updates on MLA citation in a convenient, 40-page resource based on The MLA Handbook, 8th Edition, with plenty of models. Browse our catalog or contact your representative for a full listing of updated titles and packages, or to request a custom ISBN. 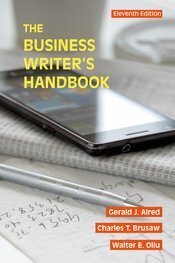 From formal reports to everyday e-mails, The Business Writer’s Handbook uses smart, accessible language to spotlight and clarify the ways we write today. Hundreds of topic entries, 90+ sample documents, at-a-glance checklists, and dynamic videos break down the best-practices, models, and real-world skills that successful writers use to communicate clearly and persuasively. With a refreshed, integrated focus on the ways technologies shape writing, the Eleventh Edition of the Handbook is the indispensable reference tool for writing successfully in the workplace.